Today is a big day for Stockholm. Most people will know about the Nobel prize ceremony. I have been somewhat involved with a lunch at the Nobel Institute a couple of weeks ago and another lunch yesterday with the delegation of one laureate. It was a very nice lunch. Unfortunately, a bunch of idiots from extreme-right groups have decided to hold a demonstration today in Gamla Stan (old town). As a result, a number of anti-fascist organizations are also demonstrating today in Stockholm. In a best case scenario traffic will be a nightmare. In a worst case, there could be some violence. All this to say that technically people should avoid Gamla Stan today. But that wouldn’t work for me. I had to go! I am a big fan of Curious Cat on the Run. She has a travel blog with a crazy number of new posts every week. Her stories are interesting, funny and entertaining. And her photos are always fantastic. She is also traveling to places I’ve been or where I want to go, which makes it even more interesting to me. But recently one of her posts made me curious and I also felt challenged. In a very cool post about the city of Brasov in Romania, she said that Strada Sforii was the 3rd most narrow street in Europe, varying between 111 and 135cm. When I asked where were the first two, curiouscatontherun said they were in England and Germany. I had a mission. 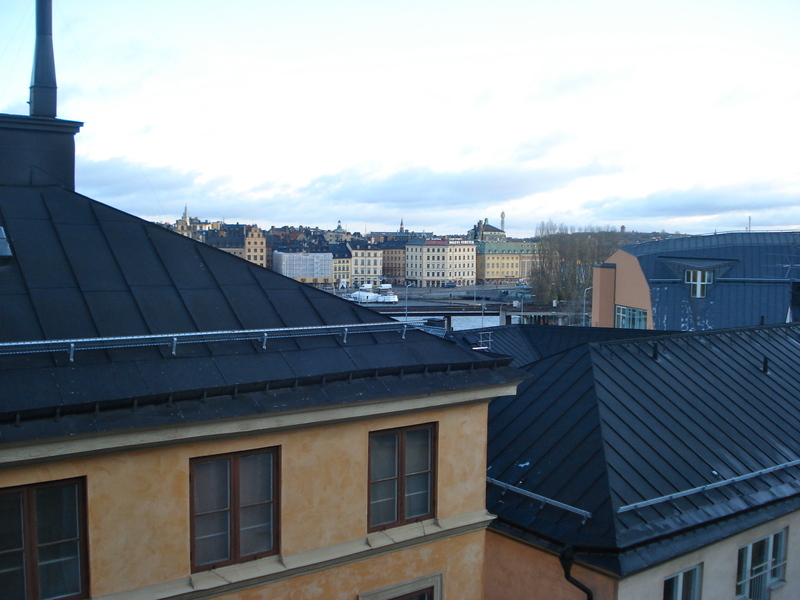 If you read my previous posts you will have noted that I live in Södermalm. And that I love it. From my flat I have a beautiful view on Gamla Stan, something I had not realized until yesterday when they took down the scaffolding from my building. 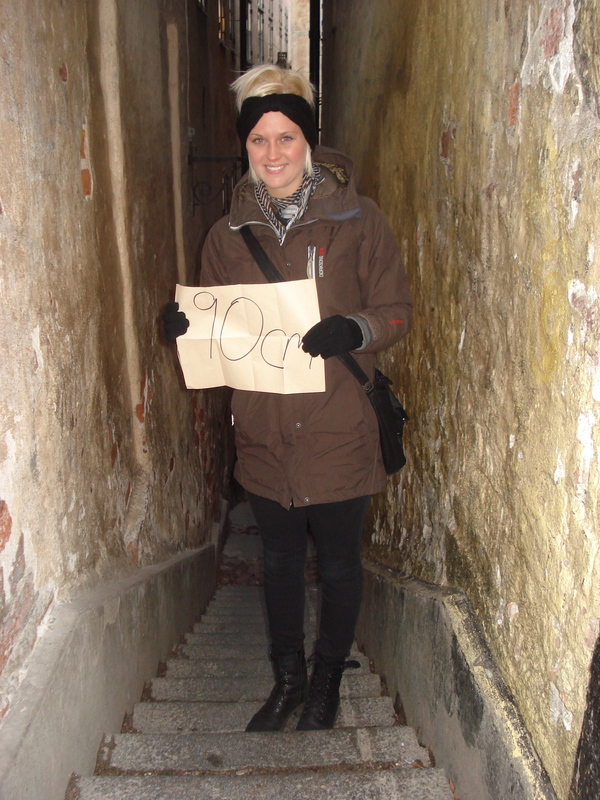 After enjoying the view of Gamla Stan for a few minutes, I picked up my measuring tape, a black marker and a piece of paper and I headed towards Gamla Stan. It didn’t take me much time to find Mårten Trotzigs Gränd as a group of tourists were standing in front of this alley and taking a bunch of photos. I was happy to find this tiny alley but annoyed that so many tourists were around. So I decided to let the tourists enjoy Mårten Trotzigs Gränd and go for coffee. I’ve only been in Stockholm for three months now and I already behave like a local, as if the city was mine! Although Gamla Stan is a beautiful part of Stockholm, it is also filled with tourists 12 months a year. This means that it is hard to find a nice “neighborhood” café on the island. Don’t get me wrong, there are plenty of nice places in Gamla Stan. It is just not the place where you go for coffee and will meet the same regulars every week. This morning I decided to go to Kladdkakan. 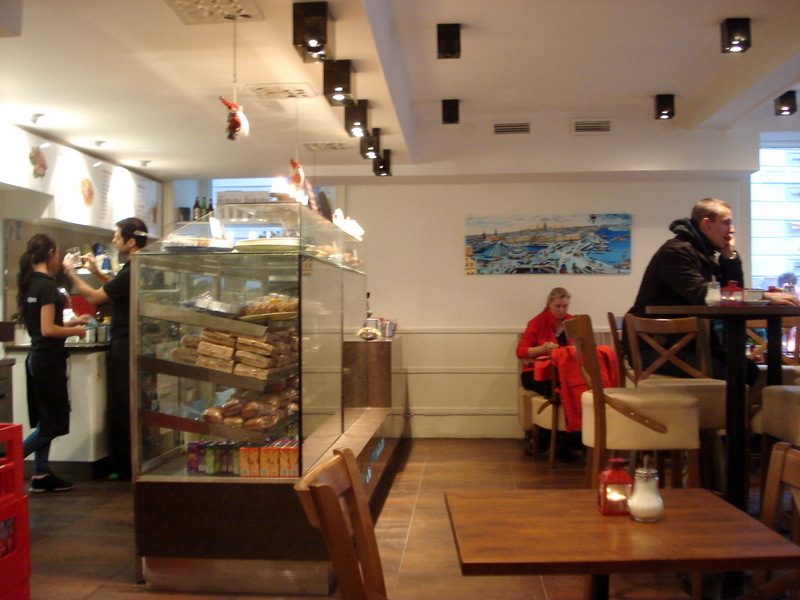 This is a nice café on one of Gamla Stan’s main streets with large windows. 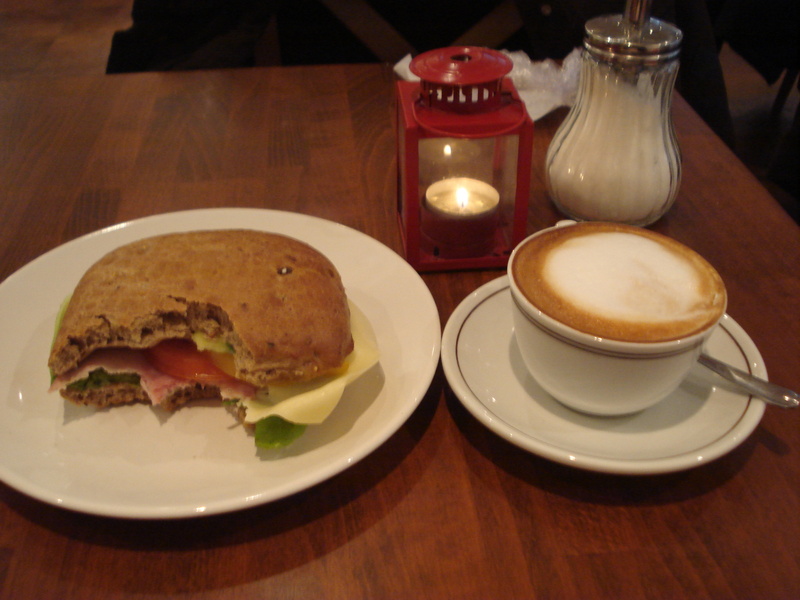 It has a good selection of coffee, sandwiches and the usual bulle. After a double espresso, I remembered that I hadn’t had anything to eat so far today and got a sandwich with a cappuccino. While Kladdkakan is a nice stop in Gamla Stan, this is not the type of café where I want to spend too much time. And I have a mission. Hopeful that tourists have left, I am heading towards Mårten Trotzigs Gränd. And what a pleasure to find the alley completely desert when I got back there. The alley is mine. The only thing missing now is an accomplice. A bunch of guys passed by but I thought that I might as well wait for a cute girl. And since this is Stockholm, I didn’t have to wait too long! Another girl who think I am crazy! My “new friend” hesitated only for a few seconds before agreeing to be part of this important experiment for the city of Stockholm. And the experiment was successful! It was a wonderful morning in Gamla Stan. My thanks to curiouscatontherun for giving me another excuse to do something totally random, and to my temporary friend who agreed to play this game with me. Hopefully the rest of the day will be quiet in Stockholm. P.S. Go and read Cat’s blog. It is fantastic! What can I say? You have absolutely made my day with your too-kind words about my blog! I’m very glad to see that you took up my challenge. That said, it looks like you’ve proved me wrong and that Brasov’s Strada Sforii is not the third most narrow in Europe – congratulations! It’s time to make sure that the Internet knows this…and to advise Brasov’s Tourist Office that one of their claims to fame is a lie! Ha! My next mission is to go to Brasov to deliver the sad news to the Tourist Office in person! Hey, all reasons to travel are good reasons! And I can’t wait to read your stories from the Balkans.